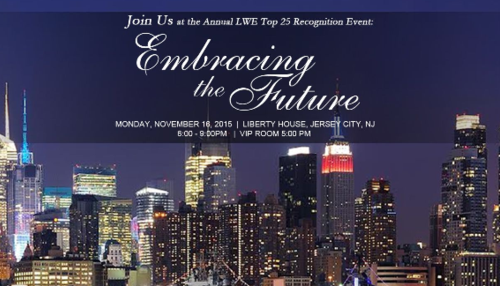 We will celebrate the Top 25 Leading Women Entrepreneurs on November 16, 2015, at The Liberty House in Jersey City, NJ. The VIP room starts at 5:00 PM. Regular attendance begins at 6:00 PM.To order tickets, reserve a booth, or place an ad in the program, contact me at 908-894-5257 or email: alyssa@pepperadmin.com or alyssa@lwenj.com. This year’s event theme is Embracing the Future and we will be showcasing women who have done just that! These exceptional women will be recognized for their strong business acumen and influence they possess to reinvent themselves and their businesses in an ever changing and ever challenging marketplace and economy. Together the LWE finalists are generating billions, employing thousands, and supporting hundreds of non-profits.